The Burla Youth Resource Centre is located in the small town of Burla about 18 kms from the Patang office. It was conceptualized by the local youth to create a space for the young to come together as a group to discuss local development issues of the region. Primarily a tribal belt, the young people who are part of the YRC are mainly from lower socioeconomic strata, from scheduled caste and scheduled tribe categories, with little or no access to education. The YRC is open to all young people between the ages of 14 – 26 years on all the days of the week from 9.30 am in the morning to 11.30pm. Being primarily a tribal belt, the literacy rate in the area is low, and so the YRC has become an ideal space for youth to connect, learn, and build their skills around this issue. The YRC is operated on community contributions and managed by young people, who have started a library and have been successful in acquiring more than 3000 books. More than 100 members from the surrounding colleges and schools have become the members of the library. The YRC also subscribes to newspapers and employment newsletters. Apart from this, the YRC regularly organizes summer camps and regular activities, such as painting competitions, folk dance and song, and theatre classes. Social issues impacting the region are also discussed, for example, ecotourism or the farmers’ movement and unequal access to water from the Hirakud dam. A Right To Information clinic has also been started in the YRC to help people understand the Act so that they can use it to make the government more accountable. The youth resource centre in PJI has taken the form of a cafe mohalla. The café mohalla is youth-led, in which young people meet every fortnight, exchange views on different issues, and enjoy each others company over a meal made by youth volunteers. Primarily urban in location, the young people who frequent the YRC are mostly from educated middle class backgrounds and are enrolled in local schools and colleges. However, young people from neighbouring villages who are studying in Jaipur invite their friends from the rural areas to the cafe meetings. Through this, there has been a lot of cross learning and exchanges between the urban and the rural youth through knowledge sharing, issue-based learning, and skill building exercises. This in turn has added greater diversity to the young people attending the YRC and has added lot of depth and meaning to the discussions. The youth from rural areas influenced by the discussions have also shown an interest and a commitment to start youth cafés in their own villages. PJI has a small collection of books and films on social issues which are used by young people for conducting workshops or for building their own learning and reading skills. All the activities in the cafe–which includes film screenings, debates on social issues, talks by guest speakers and games with a social message–are conceptualized, designed and facilitated by the young volunteers. The café is housed in the Pravah Jaipur Initiative office, which is strategically located near Rajsathan University. The café meetings takes place twice a month, but the office space is accessible to young people throughout the week from 9.30 am to 5.30 pm. The Pravah Jaipur Initiative is also outreaching to the marginalized groups through the community video unit (CVU). The youth from bastis are being trained to address the issues of their community through the medium of filmmaking. Since the CVU is housed in the PJI office, the CVU volunteers are accessing the YRC and are also encouraging their friends to do the same. Socially conscious youth from Hindu and Muslim communities have come together to start the SAHER Community Centre in Jogeshwari in August of 2010. The centre is strategically located near two colleges, and therefore is accessible to both the the college-going youth and out-of-school youth from the community. This community centre is a youth-led space and located 100 metres from the SAHER office. It has a library with small collection of books and runs computer classes for young people. Young people can come and read books whenever they have time and also enjoy interacting with each other in the YRC. Additionally, there are discussions around social issues, such as local governnace, which impact their community. The YRC is accessible on all days of the week and its open from 9.00 am in the morning till late evening and also offers skill courses on computers, painting and other topics. Every Sunday the community centre holds dicsussions on issues related to active citizenship. On average, a group of 30 young people from different social groups come to the resource centre to access information and use the library and in the process learn to appreciate diversity. Members from local youth groups use the internet facilities to source information on government programs and schemes. There are also lifeskills sessions for community youth and discussions on social issues. The community centre attracts people from both Hindu and Muslim communities and promotes interaction between these groups. Jeeban Sangha is a local youth club situated in lake gardens in South Kolkatta. There are around 350 families in the area, mostly Hindus. Most men are daily wage labourers and women work in neighbouring homes as domestic help. 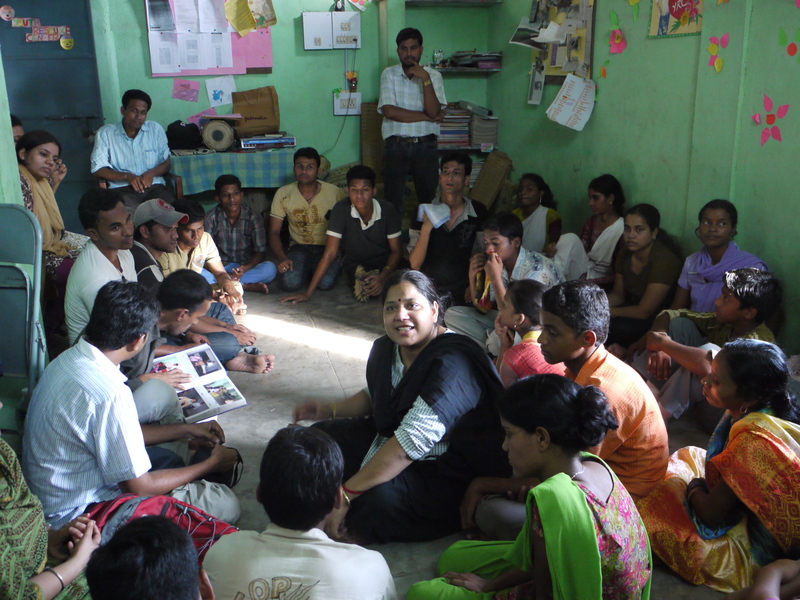 This center is being led by a young fellow, Krishna, from Thoughtshop Foundation, our partner organisation. He is providing the leadership to the group, which meets regularly at the lakes, and has developed a vision for their group and their community. This has brought about lot of personal changes in the young people of the community and also in the process, has addressed key social issues. The group meets every weekend and holds workshops, film screenings, and street plays to spread awareness on the issues of gender inequality and domestic violence, RCH and HIV/AIDS, early marriage and trafficking. Community members have begun to realize Jeeban Sangha’s role, and approach the centre for all kinds of support.